I never ever thought I would be supportive of using a composting toilet. Not that I have bias towards or against it…I just never thought of it. When we started researching how we were going to build #ChittyBang we definitely wanted a way around a black water septic. We wanted it more self sufficient than that. So we researched some other rv’ers/tiny housers who made the move to Composting Toilets, and amazingly enough it was legit. How difficult is it too install? Not difficult at all. If you are a DIYer, this will be no problemo. Since we had to manufacture all of our holes in our bus, We had to drill a hole in the floor to stick the vent tube (comes with toilet) into it, I then stapled a screen to the bottom side of that hole via construction stapler so no bugs can come in. I just used a staple gun to secure it underneath the bus and then caulked the edges. Next you install the two side brackets the toilet will be secured to. These keep it from moving in travel and use, and easily unscrews (by hand, nice sized knobs) on each side for solids emptying. But what about the smell from the solids? To be honest, as long as you have the right amount of medium in the bottom of the solids container, and only add more medium after a few solids uses, turn the handle after each use, and keep the solids hatch closed while you are going #1, you are totally good. The only time it ever stinks is if the liquid and solids mix. Ways to prevent this are to dispose of your toilet paper separately instead of in the toilet. Also, park level or at least where the urine can go into the proper tank and not into the solids tank. Some compost toilet users will put a piece of wood under the back side to tilt it to make sure the urine flow correctly. What kind of medium do you use for the solids container? From my experience, Peat Moss and Coco Core have worked the best and each can be found on Amazon. The Peat Moss is cheaper at Home Depot and you get more. 1- 3 cubic feet bag of peat moss ($13 or less) will last us about 3 months. Coco Core is the newest medium I am experimenting with. I found a 10 lb. compacted brick of Coco Core for $15 on Amazon. So far, it has lasted a month and a half and prob will last another month and a half. I carry a 5 gallon Home Depot bucket to keep my “ready” medium in, and the extra in the original bag or I will put a trash bag over it to keep from spilling. The bucket keeps the medium dry and alows me to store it right behind the front of the bus tire or in the back of the truck without worry. The Coco Core comes in a compact brick. I found putting it in a trash bag and drenching with water will allow it to break up easily without hurting yourself LOL. You can see a small section in the bucket that has been broken up by the water already. This brick will last almost 3 months for us. If saturated correctly, the texture will be soft, fluffy, not drenched or too dry. Do not try Planting Soil! Just don’t! We had ran out of peat moss and could not find it anywhere, so we ended up using Planting Soil. Big Mistake. It was like mud. I made the solids container smell sour, so I dumped and got Soil Conditioner. The texture was more like peat moss, but the chemicals in it made it have a weird smell. I dealt with it because locally there were no other options, until I decided to go on Amazon and order some Peat Moss, but just 1 cubic foot was $20+ dollars! I received it and used it anyway, and by the time I needed more, we were in an environment that sold it locally for much cheaper. Does the Urine Container Stink? Occasionally there is a smell from the pee container, but a splash of vinegar solves that quickly. You can buy additional urine containers and they do come with a screw on lid. I guess if you don’t want to empty it right away, this would be a good option for the winter. We use just the one it came with for now, but I did order an extra for just in case this one is damaged ever or if we need to just let it dry in the sun a few days. The leftover urine will dry and flake off and you can just shake it out from there. Urine container with 4 people, once a day, usually every morning. Solids container once every 4-7days. I think that since we have 3 girls, we use more TP…lol so every family is different:) We have also changed our diet while using the compost toilet and as we became healthier, the less often I had to empty it. What about emptying the poop out into a bag? Yes…it is super gross mentally. But honestly, there is not a smell if you do the soil:solids ratio right and it mostly looks like soil. I use a trash bag and gloves! 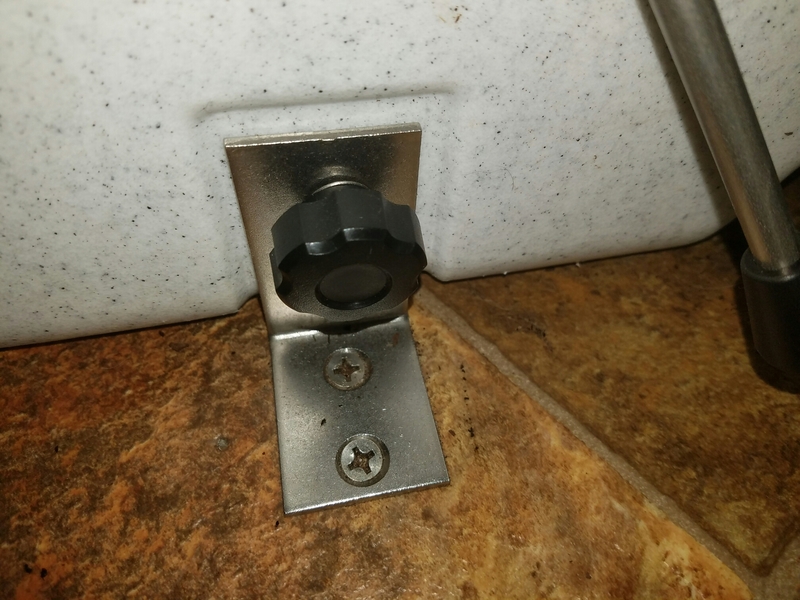 Unhook the toilet from the floor (2 screws), take vent and plug for fan out, carry toilet outside…about 15 lbs when its full I think. Unhook the top of the toilet from the base, Slip the trashbag over the top of the solids base, turn it over, and bang it out into the bag. Then we place the bag in the big dumpster at our rv spot. Seriously, the flies didn’t even go near the bag! Think about all of the diapers in our landfills, baby and elderly and hospitalized people. Maybe that will help with any mental roadblocks you may have with it. It helped me! Do you have to use the RV type toilet paper? No. At least we do not! I use the softest TP with lavender smell (charmin!) I can find. Why? Because I appreciate those small conveniences in life and I have not noticed any issues with it in out compost toilet system. The lavender helps freshen the space too! Yes. 12 volt or 110. I bought the DC adapter seperately and I plug it directly into my bathroom outlet. Or wire it with the plug it comes with directly to your bus or house batteries. The small pc fan inside the housing of the toilet uses very little electricity to pull that fresh air through the toilet and out the vent. You can wire it directly to your house batteries, or buy the transformer here to easily plug it in (that is what we did!). Can your kids do this chore? Yes. But this depends on every family. My eldest takes out the pee container. Eventually she can do the whole toilet, but I don’t mind doing it and I like to make sure it is fully cleaned. What is cleaning it like? 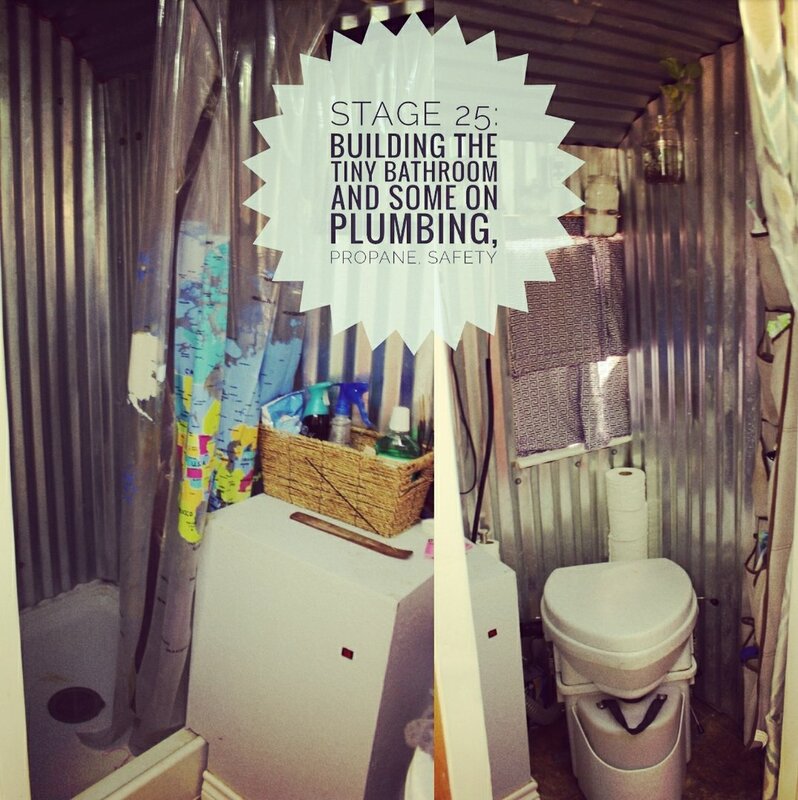 The toilet actually comes with a small spray bottle you can keep vinegar or soapy water in. Every time I dump the solids, I end the job with cleaning the outside of it with bleach (I feel better using bleach) including the handles, clamps, everything. The toilet seat is bleached too. I clean the top of the toilet (the bowl you sit on) with gloves at this time too, but I also do this if it gets dirty after use in the house. Everyone knows it is their job to clean their own mess. This happens very rarely though. Their free fans for life is great. I have used this 3 times. I like to have 1 on hand and I am down to 1 currently, but they are pretty punctual. It normally takes 7-14 days to get them. So have one on hand at least. -After caring for other human beings and animals on a homestead, from poop messes to full blown vomit…adult and child… taking care of and cleaning this toilet is not crazy. If you don’t think you can do it, even after researching, don’t! Everyone has their own limits of comfortability, which is what building your own home is all about:D It is prob easier to just go with the black water first and then take it off later if you want to go compost option.